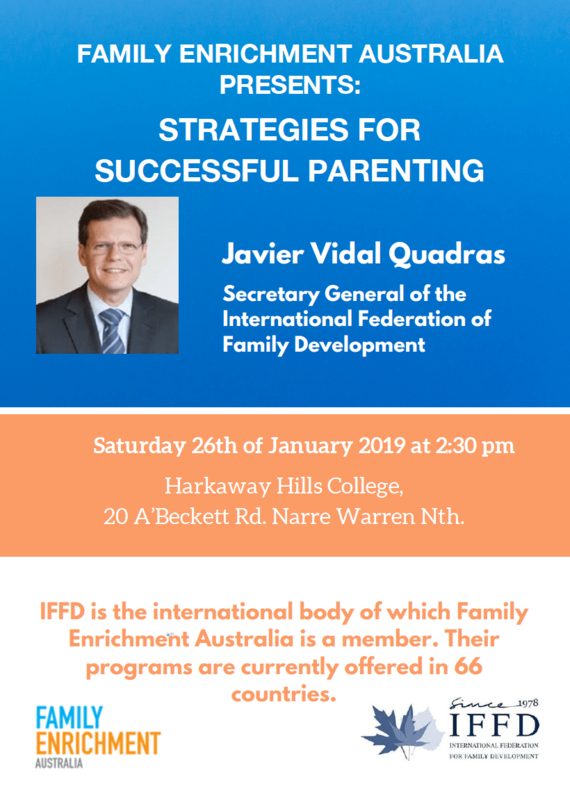 Family Enrichment Australia invites you to “Strategies for Successful Parenting”, a talk by Javier Vidal Quadras, Secretary General of the International Federation of Family Development. Javier is the Secretary General of the International Federation of Family Development and Deputy Director of the Institute of Advanced Family Studies. We are very fortunate to have Javier with us in this only Melbourne event following his extensive speaking program in Sydney. Date: Saturday 26th January, 2.30pm, followed by afternoon tea. Venue: Harkaway Hills College, 20 A’Beckett Rd, Narre Warren North. Babysitting: Available for $15 per family during this event. RSVP: For catering and babysitting requirements to Rachel Poh as soon as possible: feavic@gmail.com.